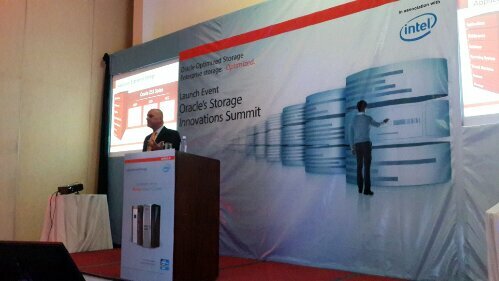 Oracle launched 3 storage products at the Crowne Plaza, during their Storage Summit. The products are ZS3, StorageTek T10000D and LTFS Library Edition. Ahmad Qawasmeh, Oracle Storage Director, Middle East and Africa during his keynote speech slated that “Oracle has and is working on Storage Engineered with Applications, Industry hardened Architecture and Enterprise-Grade Cloud Services.” He stated that Oracle is continually striving to improve efficiency, at lower costs with optimised performance. Their strategy is to build hardware around their software and databases; this leads to a unified system having databases that are storage aware. Mr. Ahmad stated that Oracle is the best option as they avoid the API system and build the hardware with full knowledge of the software. At the event Oracle claimed that their products such as the ZF3 system can minimise I.T. work by 65% and have unrivalled price point performance. Their claim to the throne of Data Storage is supported through the following two benchmarks. New Oracle ZFS Storage ZS3-4 achieves the highest ever Storage Performance Council SPC-2 Result for processing throughput and beats the price/performance ratio delivered by the IBM System Storage DS8870 and HP P9500 XP Disk Array by over 3x. Oracle’s new ZS3 storage delivers world-record SPECsfs2008_NFS overall response times, plus the combination of extreme throughput, and exceptional value to enable customers to run database systems faster and at lower cost than comparable NAS systems from NetApp. For those in search of more information on their services and products click the following link to wind up at their website.